This character preparation handbook tells you exactly what you need to know to become the kind of actor people want to watch. No matter your level of experience, you’ll love the perspective of this highly readable book. The concept of the menu categorizes the elements of character development into a list that’s easy to master. The “appetizer” of the book provides a strong background as an introduction. Howey then explores at length the “essential ingredients” — emotion, objective, past experiences, subtext, and traits. 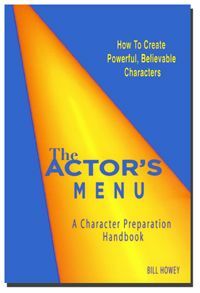 The “recipe” instructs how to read the script, generate the impression, and reinvent the character’s story. “Seasoning” this with improvisation, masking, and making the most of transitions adds the final touches. By following the techniques outlined in this handbook, your “dessert” — or reviews — should be very sweet!